Our annual Welcome Back Lunch, held on Imagine Day, hosts all transfer and returning Arts Undergraduate students to come and learn about the Asian Studies experience and join the Asian Studies community. Meet with faculty and staff, network with alumni and mingle with students over lunch. Imagine day is your greatest opportunity to become aware of the programs across campus and start planning ahead! We hope that you will leave more knowledgeable about our Language and Culture Programs, UBC’s Go Global Exchange Program and UBC’s student work opportunities. 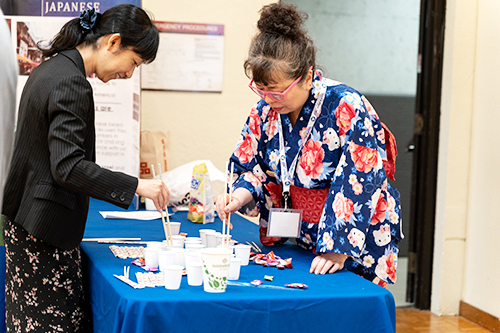 Japanese Instructor Masumi Abe runs a booth at the 2018 Welcome Back Lunch.